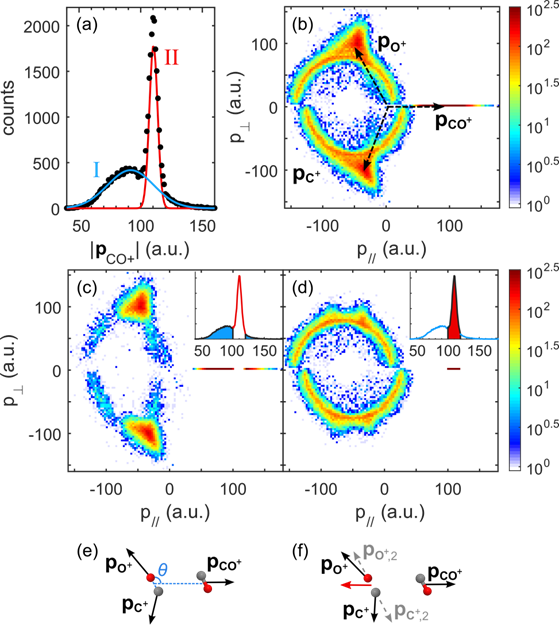 Abstract: We triply ionize the van-der-Waals bound carbon monoxide dimer with intense ultrashort pulses and study the breakup channel (CO)23+-> C+ + O+ + CO+. The fragments are recorded in a Cold Target Recoil Ion Momentum Spectrometer (COLTRIMS). We observe a fast CO2+ dissociation channel in the dimer, which does not exist for the monomer. We found that a nearby charge breaks the symmetry of a X3Π state of CO2+ and induces an avoided crossing that allows a fast dissociation. Calculation on the full dimer complex shows the coupling of different charge states, as predicted from excimer theory, gives rise to electronic state components not present in the monomer, thereby enabling} fast dissociation with higher kinetic energy release (KER). These results demonstrate that the electronic structure of molecular cluster complexes can give rise to dynamics that is qualitatively different from that observed in the component monomers. Fig 1. (a) Momentum distribution of CO+. Black dots show experimental data; red and blue curves show the fitting with two Gaussian distributions. (b) Newton diagram for all events in the channel (CO)23+-> C+ + O+ + CO+. (c)-(d) are Newton diagrams for events in different subsets. Corresponding CO+ momentum is shown in the top right insert figures. (c), |pCO+| <100 a.u. or |pCO+|> 120 a.u. ; (d), 100 a.u. < |pCO+| < 120 a.u.. (e) and (f) are sketches of direct and sequential dissociation processes. Black arrows, the final momentum of each fragment; red arrow, momentum of CO2+ in the first dissociation step; grey arrows, momentum of C+ or O+ from the second dissociation step. Geometry with minimum energy is shown as an example. Xiaoyan Ding, M. Haertelt, S. Schlauderer, M. S. Schuurman, A. Yu. Naumov, D. M. Villeneuve, A. R. W. McKellar, P. B. Corkum, and A. Staudte, Phys. Rev. Lett. 118, 153001 (2017).